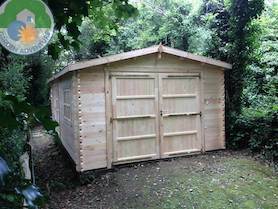 Our range of timber garages has just got even better ! Most are now manufactured from the sturdy 44mm logs which allows larger construction and design options. From the most basic of single garage sized 4m x 6m why not consider enlarging for either a double garage or combination garage / car port. All designs are flexible and custom build options are also available to tailor a solution perfect for your needs - you may require a sperate shed or work shop within the same building - not a problem, let us know your design and we will be pleased to provide competitive costings. You won't find a better range of timber garages that are fully specced and of quality build yet at a cost that won't break the bank - why not call us now to discuss your individual requirements and see how we can help.